Google Plus (aka: Google+) has emerged as Google's latest entrant in the social media world. Continue reading for answers to a few popular questions and a basic outline of the current features of Google+. Google+ is a social networking system for connecting with others and sharing content. Why would I want to use Google+? It is difficult to say whether or not Google+ will have a long lasting impact in the social media world. We are providing this information to encourage you to stay ahead of the curve on new tools so you can benefit from the ones that are the right fit for you. Is Google+ a fit for business? At this point Google+ is aimed at the personal user (John Doe rather than John Doe's Company). There are no Facebook style group pages to promote your business…yet. Google has confirmed that business pages are on the way. Despite not yet having specific business pages, you can still use Google+ to connect with those you do business with. Social media is about engaging and conversing, not direct return on investment. If you are in the business of talking with other people, which we all are, a Google+ profile may be a great avenue for you to connect. Of course, when using Google+, or any other social networking platform, you need to carefully consider how you represent yourself through the content you share. Circles are how you organize your friends, family and acquaintances. Using circles you can control who sees what. You can use Google's default Circle's setup or create your own. You do not need to add someone to your Circles in order for them to add you to theirs. For example, you may choose to add John Doe to one of your Circles so you can follow his stream of activity, but he is under no obligation to add you to one of his Circles. Your Stream is a list of all the recent activity from yourself and your Google+ Circles. You can comment on other people's activity in your Stream. If you want someone to remain in your Circles, but do not want to view their activity on your Stream you have the ability to mute their activity. Sparks let you find different things that interest you and share your interests with others. For example, if you add Movies to your Sparks list you can click to view news about Movies and then share that news on your Stream. The intention of Sparks is conversation. Sharing interesting content with friends is a means to 'Spark' a conversation on your Stream. The Hangouts feature allows users to video chat with people who are in their Circles. In these early stages of Google+ the Hangouts feature is said to be still under considerable testing and development, but is also viewed by many as a major competition to the new Facebook/Skype relationship. If you already have a Google Account chances are you have setup a Google Profile, possibly without even knowing it. When you start with Google+ one of the things you'll want to do is create, or edit, your Profile to ensure it is displaying accurate information. The Photos page of your Google+ account allows your to create albums, view albums from those in your Circles, comment on photos and tag people in photos. You also have the ability to set privacy options on your photos. You may notice little +1 buttons on the websites and Google search results. These are a part of Google+. Clicking a +1 button is a way to recommend content you like to others. In order to +1 something you need to be logged in to your Google Account. Here is an example of a +1 button you can try clicking. 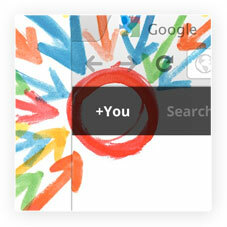 You may want to have a +1 button on your website so that others can recommend it through Google+. Contact us to learn more about adding the button to your website. As you Edit each element of your profile (ie: Introduction, Occupation, Education, etc.) you will notice that you have the option to select who can see each piece of information. You have the choice to display your information to anyone on the web, just those within your circles or no one at all. You can also customize which circles can and can't see information by selecting "Custom" under the selection list. There are also a couple more privacy options, such as photo sharing privacy, accessible by clicking your name near the top right of your window and selecting Privacy from the drop down menu. Often, a system like Google+ will be defaulted to send a considerable amount of email notifications to you. You have the ability to control the notifications you receive by clicking your name near the top right of your window and selecting Privacy from the drop down menu, then Google+ from the left menu. You will be presented with a check list of the different notifications to turn off if you desire. Google+ is available through the Internet browser on most major smart phones by visiting m.google.com/plus or using the ScanLife mobile app (ScanLife.com) to scan the following QR code. Want to chat more about Google+? 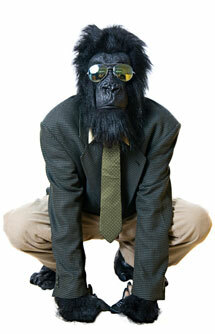 Drop us a note to hello@mymonolith.com. Social media is everywhere these days. It can be daunting to figure out the big picture, but doesn't have to be. If you are interested, send us a note and we will have a casual conversation about what's happening and how you can be a part of it.